I don't claim to be proficient at many things. But when my family and I were able to try Pumpkin Masters carving kits, I became a (semi) skilled carver. Here are a few tips and tricks to carve your own pumpkins like a pro. Start with a simple pattern. Carving pumpkins is a great family activity, but if your patterns are too difficult, you'll get frustrated and never finish. A simple pattern can be just as impressive when it's done right. The pumpkin below was carved by a 5-year-old! For detailed carving, move the pumpkin off the table and onto your lap. You'll have more control over your tools. 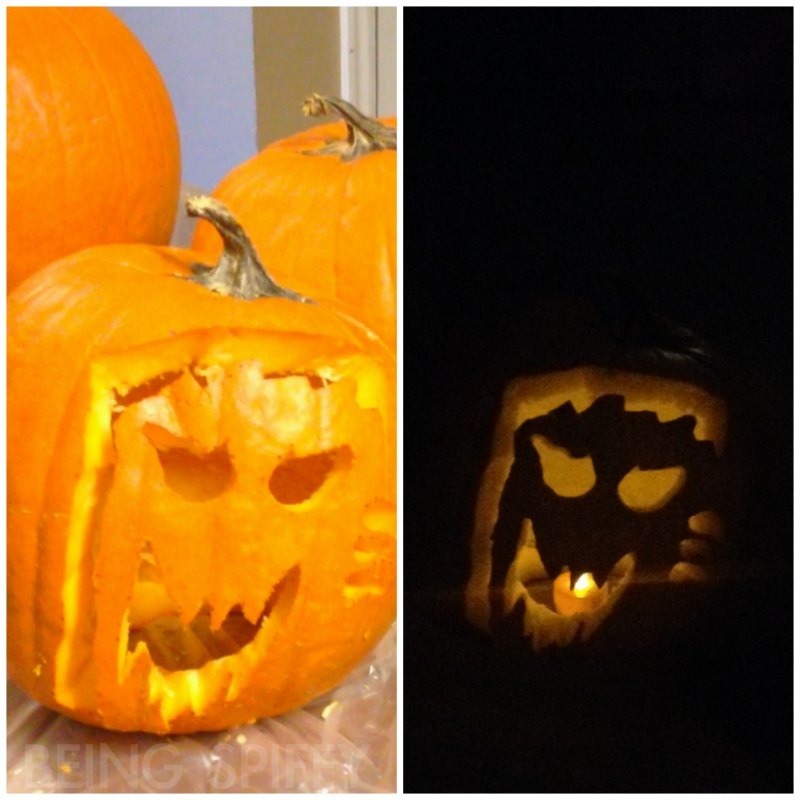 I let my kids get right into the action using saws and tools from the Kids Carving Kit. This might sound weird, but turning the pumpkin over to carve makes you focus less on perfecting your design and more on precision carving. When you're done connecting the dots, you'll turn your work over to find a masterpiece. Work smarter with pattern prep. Pumpkin carving is a great, inexpensive way to celebrate Halloween with your family and friends. But…it can be time consuming. Especially when a big group is involved. By using the Pumpkin Masters carving kits, you can pre-apply design templates using their handy perforating tool. It dents the skin just enough to see where to carve. Just apply the templates, perforate the designs, and set the pumpkins aside until you're ready to clean them out and carve like pros. If you look closely, you may see the outline of a cat. These are just a few tips to create your own pumpkin masterpieces. My own kiddos felt like pros after our carving escapades. Mine's not too shabby either, if I do say so myself. Do you want to carve pumpkins like a pro? Pumpkin Masters is available at your local grocery, drug, or craft store, and nationally at Target and Walmart. If you're already a pro, Pumpkin Masters is searching for carving talent as part of its annual Pumpkin Masters Carving Contest. Just share a pic of your carving via Instagram or Twitter with #PumpkinMasters2013, submit via the Facebook app, or send via email to: social@pumpkinmasters.com to enter for the chance to win one of six prizes, including $5,000 for the Best Pumpkin. The contest runs from October 1–31, 2013 so get to carving! For contest details and official rules, visit http://clvr.li/pumpkinmasters2013.